This stew can be made in the crockpot or the oven. I used the oven this time, since it was a Saturday and we were home all day. Mix all the ingredients in a heavy, covered pan or the crockpot. If you use the oven, cook on 250 degrees for 4-5 hours, stirring 2-3 times during the cooking. 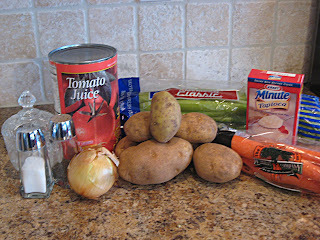 I’ve also “cheated” with this recipe and used the frozen bags of stew vegetables from the grocery. They don’t need nearly as long to cook and taste almost as good. Plus they have pearl onions in them, which I happen to love.